Fresh Start is now located at 16 Brent Drive in Hudson. The fastest way to contact us is through our Online Furniture Pick-up Request Form (at the bottom of this page). Fresh Start Furniture Bank relies heavily on the generosity of individuals, companies and community service groups. In 2019 we expect to furnish the homes of ~770 low income families with over 24,000 pieces of donated furniture and home goods. All donations to our organization are tax deductible. 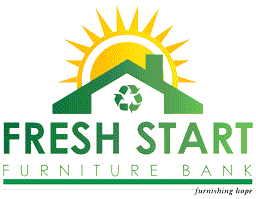 Fresh Start Furniture Bank is a 501(c)(3) not-for-profit charity. We will provide you with an itemized receipt of your donations for tax purposes which includes donation value ranges as provided by the Salvation Army and Goodwill. We do not place values on donated items. To help estimate the value of your donation you can check out the Salvation Army Guide, IRS Guide or Goodwill Valuation Guide. Almost all of your donations are given, for free, to families in need. However, we do consign some items of value which are not suitable for distribution to our customers, such as antiques, in order to help pay for some of our operating expenses. * = Parts of town may be outside of our 20 minute pick-up radius. Use the form below to check. Before contacting us, please review our donation guidelines. Then use the on-line pick-up request form for fastest response or call us. We cannot accept items which are broken, torn, stained, covered with pet hair, non-functioning, smell like smoke or are missing parts. Items need to be clean and in good working order. We cannot accept items which are broken, torn, stained, covered with pet hair or mold, are missing parts or are non-functioning. Bunk Beds: Please provide assembly instructions if it is not obvious how it goes together. We cannot accept items which are broken, torn, stained, covered with pet hair, non-functioning or are missing parts. We do not have the capacity to make major repairs to items or make any repairs to upholstered items. We do not accept unfinished furniture or items needing significant refinishing/repainting. Minor flaws are OK.
Baby cribs, changing tables, high chairs, jump seats, playpens, swings, etc. Ikea furniture which you had to assemble when you got it. We encourage donors to drop off items if possible. Please review our Take/Do Not Take list to make sure that we will take your items. Call or e-mail us if you are unsure that we will accept certain items. Tuesday & Thursday from 10-12 and Saturday 9-12. We are located at 16 Brent Drive in Hudson. The entrance to the parking lot is on the left near the top of the hill. Our door is located just before you would drive around the back of the building. Click on the following link for a map. We cannot accept items which are broken, torn, stained, covered with pet hair or mold, are non-functioning or are missing parts. We request that you provide a tax deductible monetary donation to help us cover our operating costs. Our organization is 99% volunteer based, but we have $80K a year in rent, $20K for a part time volunteer manager, $5K to run the truck and another $15K for utilities, insurance, etc. There is no fat in our budget and we need this to help pay for our operation. We understand that you're already donating items (which we give away), but that doesn't help keep the lights on or pay our other bills. It costs us $50 to pick up your items. As a result a typical donation runs between $50 and $150. If possible, please move the furniture to be picked up to your garage or first floor level. The volunteers who will pick up your furniture are NOT professional movers. We have a very limited pick-up schedule, so be sure to contact us well in advance to determine what time slots are available. In general, we only pickup within a 20 minute driving radius of downtown Hudson. Use the following form to see if you're within our pick-up radius. Enter your street address & city and then press "Calculate time". If you are greater than 20 minutes away, please consider dropping the items off at our store or check here for some other organizations.